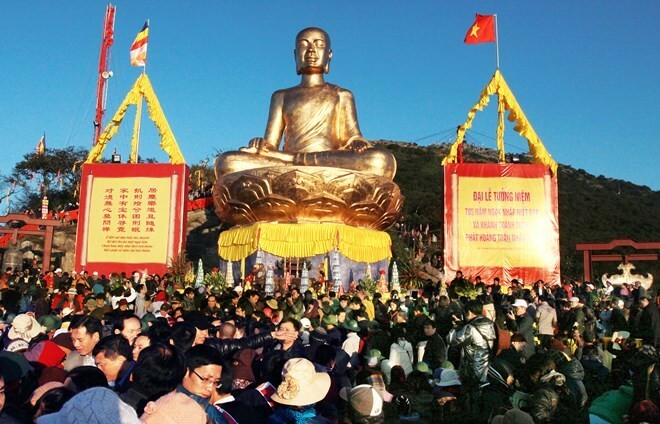 Yen Tu is a famous landmark in Quang Ninh, where is attached to the Vietnam Buddhist religion, when Tran Nhan Tong Buddha (he is also a king of Vietnam) renounced the throne for going on Yen Tu Mountain to practice Buddhism. He founded the Truc Lam Yen Tu Zen Sect. Today, when people talk about Yen Tu, they think immediately about Yen Tu Festival takes place from January, 10th until the end of March in lunar calendar. However, tourism activities in Yen Tu took place throughout the year; the cable car also shortens distance of moving and saving the time for travelers. This gives you more time to enjoy beautiful scenery of clouds and mountains in Yen Tu. Especially, on nice days, from the summit you can see Halong Bay. Yen Tu Festival annually starts from January, 10th to March in lunar calendar, attracting thousands of people from around the country coming here for worship and visiting. If you go in the festival season, especially the first day of festival, it will be very crowded. If your purpose is worship and joining into the festival, you should go in February. If you go for sightseeing purposes, you can go any time of the year. Every day, there are buses go to Ha Long from My Dinh bus station, all kind of these buses will pass over Yen Tu. It is very easy for you to go to Yen Tu with a lot of bus company as: Kumho, Viet Thanh, Duc Phuc, Ka Long and many other buses. The bus to Halong, Mong Cai leave continuously, there is one bus every 30 minutes. Fares is about 90 000 VND / person. Direction, you start from Hanoi to Bac Ninh, then you turn into Highway 18 going to Cam Pha, Chi Linh, Dong Trieu, Uong Bi, you will see Trinh Yen Tu temple, from here you turn away to Yen Tu. If you go by bus, you should remind the bus’ driver stop at Trinh Yen Tu temple area in order to go continuously to Yen Tu. From Hai Phong to Yen Tu, you will go through Nui Deo town, then you get in 10th street, and turn left into Highway 18, you keep going about 2 km and see the way to Yen Tu. From Trinh temple, you can take a motorbike to Yen Tu (costs about 35 000 VND / person, or take a taxi. In addition to the bus routes run daily to Halong, you can go straight to Yen Tu with the bus of Hanoi Transportation Company. This bus run daily on festival season, outside of festival time, they only run on a Sunday, you can contact them directly to ask about departure time. Fares for reference is 180.000 VND/roundtrip. On the way to explore Yen Tu, the first attraction to be encountered is Giai Oan Spring (Justifying Spring) with a majestic green stone bridge connecting two sides. This bridge is 10 meters long, which was built firmly in an antique architecture. Legends said that when King Tran Nhan Tong decided to resign from his throne to become a monk, his wives and concubines tried to persuade him changing his mind by suicide into the spring. Mourning for them, the monk king built a temple nearby and named the spring “Giai Oan”. Climbing for around 30-45 minutes, you’ll be able to reach a lush green courtyard, highlighted by vivid color from different species of flowers of the a pagoda. The pagoda is surrounded by six enormous towers, amongst which the biggest one is to worship King Tran Nhan Tong. Climbing further to the height of 700m is Van Tieu Pagoda lying inside layers of white clouds, and Đong Pagoda on an impressive height of 1,068m, which is made totally from copper. Both pagodas are dated back thousand years ago, and are very sacred to visit. You should wear soft shoes for hiking. Clothing: depending on the season. In the winter, you should bring jacket. If you go in high season, you should buy a return ticket of cable car. So, you will not have to wait to buy the back ticket. You should do sightseeing on the way down to the bottom of mountain. Do not buy something along the way. Beware pickpockets in crowded places. Put garbage in the trash.